What Is VA Form 10-10d? VA Form 10-10d, Application for CHAMPVA Benefits is a form used to apply for health benefits program, in which the Department of Veterans Affairs (VA) shares the cost of some health care services and supplies with eligible veterans. The latest version of the application - sometimes incorrectly referred to as the DD Form 10-10d - was released by the VA in July 2014 with all previous editions obsolete. An up-to-date VA Form 10-10d fillable version is available for download below and can be found through the VA website. The surviving spouse or child of a person who died in the line of duty and not due to misconduct. How To Fill Out Va Form 10-10d? Application for CHAMPVA Benefits, submit and sign. benefits and payment for services. data collection is to determine eligibility for CHAMPVA benefits. after June 5, 2001, or if you were already enrolled in Part B prior to June 5, 2001. Sponsor – Refers to the veteran upon whom CHAMPVA eligibility for the applicant is based. institution---school certification required (see below). the spouse or surviving spouse. normal beginning and ending school year. The form is distributed without any filling guidelines provided. Step-by-step instructions can be found below. Section 1 covers Sponsor Information. A veteran, upon whom CHAMPVA eligibility of the applicant is based, is a sponsor. This Section must include the veteran's full name, their social security number, veterans affairs file number, mailing address with ZIP code, telephone number, date of birth, date of marriage, and date of death, if applicable. The form requires the applicant to state whether the veteran is deceased or not and whether they died while on active military service. Section 2 requires information about the applicant. This includes their full name, social security number, mailing address with ZIP code, telephone number, date of birth, and relationship to the veteran. The applicant must indicate if they are enrolled in Medicare and if they have other health insurance. Positive answers require completion of the VA form 10-7959c and attachment of a Medicare Card to the VA Form 10-10d. Section 3 is for certification. In order to extend CHAMPVA benefits to students age 18 to 23, school certification of full-time enrollment must be submitted by the college, vocational or high school. The applicant states student's full name, telephone number, relationship to the applicant and the address, including street address, city, state, and zip code. VA Form 10-10M, Medical Certificate is a document attesting to the result of a medical examination of a veteran. It is completed and signed by both doctor and patient. 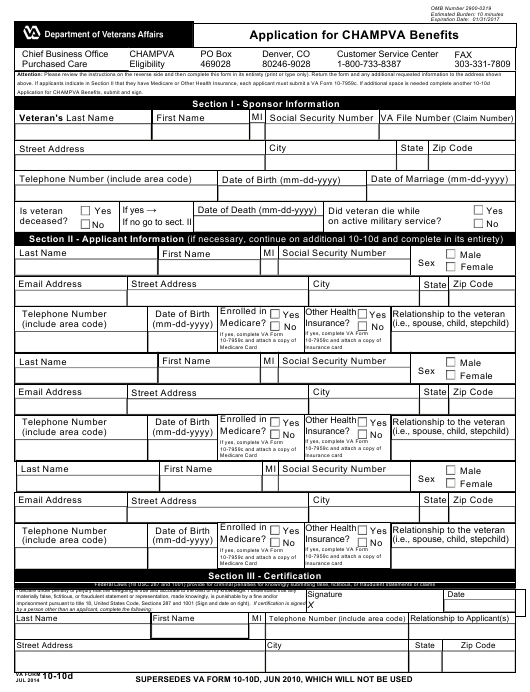 VA Form 10-10EZR, Health Benefits Renewal Form is completed by veterans and used by VA to update veterans' personal, insurance, or financial information after they are enrolled. VA Form 10-10SH, State Home Program Application for Veteran Care Medical Certification is completed to apply for State Home program. It includes quality care for veterans in a nursing home, domiciliary, and adult day health care. VA Form 10-10EC, Application for Extended Care Services is necessary for veterans who need assisted living, residential (live-in), or home health care through VA. These services include 24/7 nursing and medical care, physical therapy, help with daily tasks, and managing pain. VA Form 10-10HS, Request for Hardship Determination is used by veterans whose gross household income has decreased. They may be qualified for copayment exemption for the remaining calendar year. VA Form 10-10EZ, Instructions for Completing Enrollment Application for Health Benefits and its equivalent in Spanish (VA Form 10-10EZ, Instrucciones Para Solicitar La Afiliacion A Los Beneficios Medicos) are used by veterans to apply for enrollment in the VA health care system.